The Sydney Super Dome is a large multipurpose arena located at Sydney Olympic Park, at Homebush Bay. 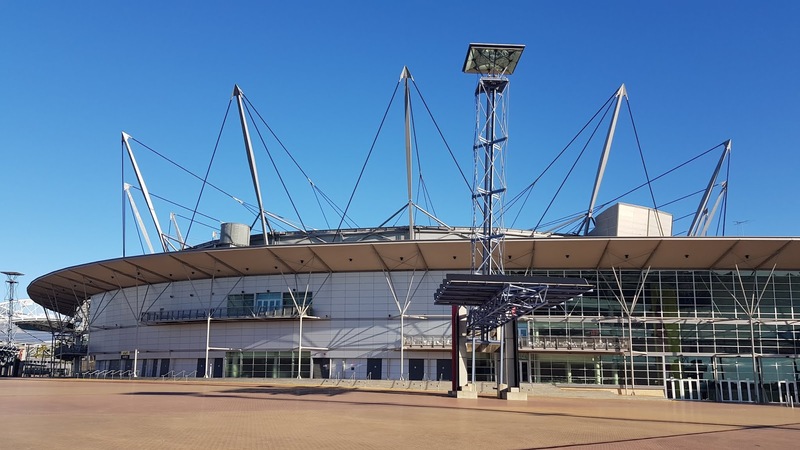 It was completed in 1999 as part of the facilities for the 2000 Summer Olympics, It is currently known as the Qudos Bank Arena and hosts many concerts and events. Linked to: Our World Tuesday, Tuesday Treasures, Pictorial Tuesday, Travel Tuesday, Blue Monday. Corporate naming rights- a blight in many parts of the world. I had quite a bit to do with the 1956 Olympic Games in Melbourne and loved every moment of it. Sydney must have also grown and blossomed during the 2000 Games. ...William beat me to the punch! Life today is all about the money. Thanks Jim for stopping by, enjoy your week. What sports are played there? During the Olympics it was used for gymnastics, including trampoline. Since then it has hosted basketball, netball and tennis. It's mostly used for concerts and award shows these days. In the thumbnail it looked like a ship! We most likely seen the inside while watching the Olympics on TV. Glad it's getting lots of usage. Thanks for sharing at Pictorial Tuesday. Wonderful stadion and such a clearly sky! Incredible! Have a wonderful weekend! It is surprisingly low to the ground...are there several levels below ground? Stanley, I'm not sure if it's partly built below ground but its very wide and with the masts on top, perhaps the angle of the photo is deceiving. A beautiful sky, Jim, but I'm of two minds about the architecture. Attractive as in "come see me" — I'm not so sure. Great sporting facility, Jim, but I agree with Kay above!